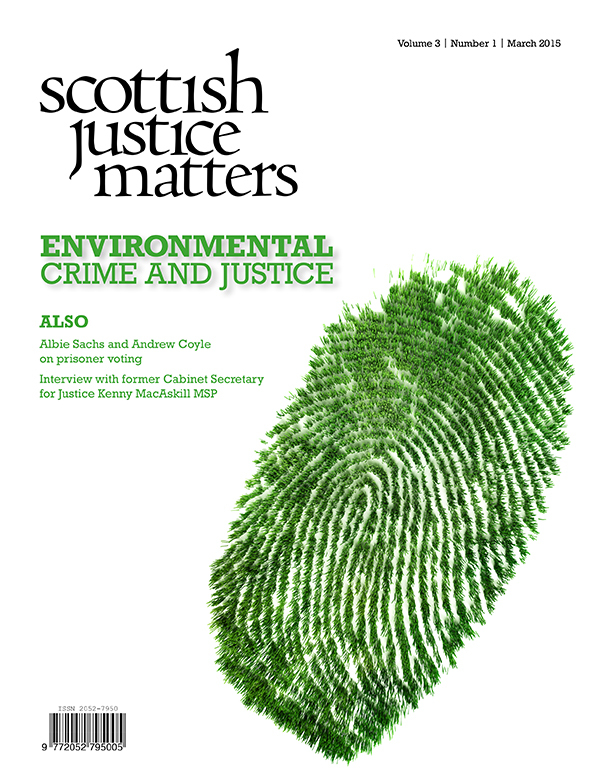 A new digital, open access journal for evidence, ideas and informed opinion on all matters relating to crime and justice in Scotland. Scottish Justice Matters (June 2013). The Reform Issue. 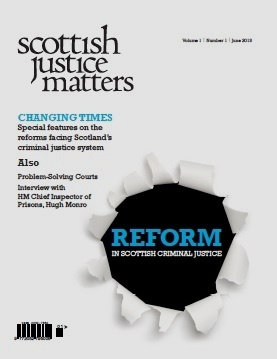 Theme on reform of Scottish criminal justice co-edited by Alan Staff and Nancy Loucks. Also: Mary Munro on changes to independent prison monitoring, Cyrus Tata on problem solving courts, Niki Kandirikirira on female genital mutilation in Scotland, John Fotheringham on the law and female genital mutilation, Allan Weaver on a day in the life of a criminal justice social work team manager, Greg Berman and Aubrey Fox on trial and error in criminal justice reform in the USA, interview with Hign Monro, retiring HM Inspector of Prisons. 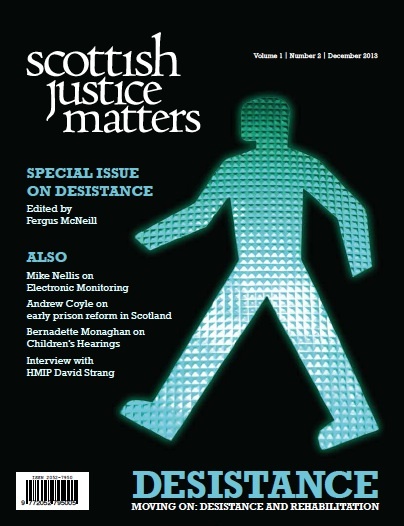 Scottish Justice Matters (December 2013). The Desistance Issue. Theme on desistance edited by Fergus McNeill. Also: Mike Nellis on electronic monitoring, Bernadette Monaghan on Childrens’ Hearings, John Downie on short term funding, Andrew Coyle on William Brebner, Frida Wheldon on victims’ rights, a mother on visiting a son in prison, interview with David Strang, Prisons Inspector, Martine Herzog-Evans on French JAPs and ‘Take 5′ politicians on reducing reoffending. 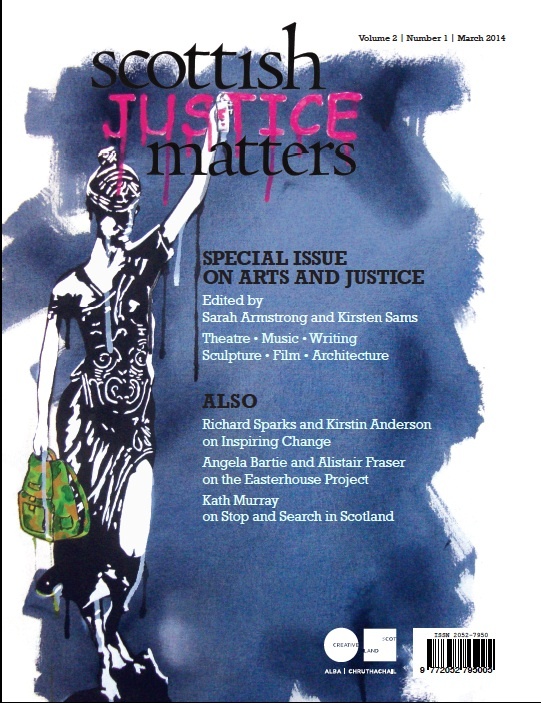 Arts and Justice theme edited by Sarah Armstrong and Kirsten Sams. Articles by on evaluating arts initiatives, prison architecture, researching co-production in community, prison arts, music, sculpture, reading, drama, community based projects, women in focus, young people in Dundee; international contribution from Lieux Fictifs, Marseille Prison; interview with artist Wullie Sinclair who discovered the power of painting while in prison. Also: Kath Murray on stop and search and the failed legacy of MacPherson in Scotland, Rob Strachan on Public Social Partnerships, Gail Wilson on responding to the needs of very vulnerable young women, David Orr and Mary Munro on the recent developments in restorative justice in Scotland, MSPs on what a smart justice system should look like in an age of austerity. Angela Bartie and Alistair Fraser on the Easterouse Project, youth and the arts in Glasgow 1968-70, Sarah Armstrong takes a critical look at prison population forecasts. Mike Nellis reviews Andrew Davies’s book on inter-war Glasgow gangs and Jo Buckle reviews Leo Cheliotis’s edited collection on arts and imprisonment. 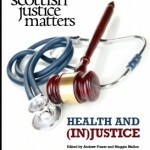 Articles include: Sarah Couper on old age and disability in Scottish prisons, Paul Hayton on reforms to prison medical services, Andrew Fraser and Lesley Graham on mortality in prisons, poor health and people in the Scottish justice system, Elizabeth Shaw on neuroscience and justice. Bridget McKinnon tells us why police need better training to respond to mental health crises, and the public health case is put for decriminalisation of drug use by Mike McCarron. Fergus McNeill and Gerry McCartney have a conversation about inequalities in public health and desistance. Former prison governor Dan Gunn reflects on what should be done to improve both health and justice. In Nancy Louck’s interview addictions specialist Oliver Aldridge talks about addiction, justice, trauma and inequality. Also, expert in Scots criminal evidence, John Blackie, reviews the current debate on reform of the corroboration rule; Christine Scullion outlines the Robertson Trust approach to funding and evaluation in criminal justice; Des Fik describes the work of the Alternatives to Violence Project. In our international strand, Karin Sten Madsen considers the difficult question of restorative justice for women referred to the specialist sexual crime unit at Copenhagen Hospital. 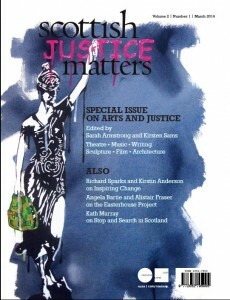 Connecting back to our arts and justice issue (March 2014), Mike Nellis’s contribution to our history strand considers arts in prison, and the Barlinnie Special Unit. 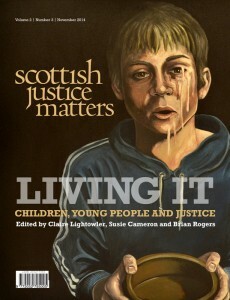 The “Living It: children, young people and justice”issue (November 2014). This issue is guest edited by Claire Lightowler, Brian Rogers and Susie Cameron. There are articles on trauma and young people in trouble, cyberbullying, getting a job with convictions, Youth Advantage Outreach, the implications of the Edinburgh Study of Youth Transitions and Crime for non intervention in the lives of young people, criminal justice social work in Moray, the crisis in mental health provision for young people, having a sibling in prison, what it’s like to be in secure care, school exclusion and who young people have told us has made a difference in their life. There are also articles on new approaches by justice analysts to evaluation justice projects, domestic abuse policy and young people, initiatives to support military veterans who have got into trouble with the justice system. Our international article coniders a new global initiative to research childhood imprisonment. In our history section we have a police officer’s account of dealing with the ‘Bouley Bashers’ of Aberdeen, and the first of two articles about prostitution and social control in mid-19th century Glasgow. This issue is edited by Hazel Croall. Articles include Nigel South on enviromental criminology, Hugh Pennington on E.coli O157, Robert Smith on the farmer as environmental criminal, Andrew Watterson on pollution and ill-health, Caroline Matheson on care farming, Nick Underdown on gear conflict in the Scottish inshore fisheries, Ian Thomson on prosecution of raptor crimes, Mary Church on the Aarhus Convention, Gayle Howard on SEPA and waste crime. There is also an interview with Rob Edwards, a journalist specialising in reporting on the environment. Other articles feature an interview with former Cabinet Secretary, Kenny MacAskill; a dialogue on prisoner voting between Albie Sachs and Andrew Coyle; research into long term prisoners and their attitude to their sentence, by Marguerite Schenkel; Anna Forrest writes on child prostitution in Victorian Glasgow; and much more. 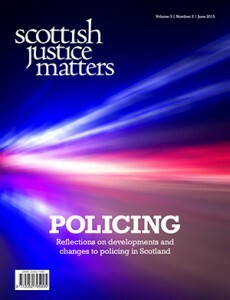 This issue is edited by Nick Fyfe, director of the Scottish Institute for Policing Research (SIPR) and professor in the School of Social Sciences at the University of Dundee, and Alistair Henry, associate director of the Scottish Institute for Policing Research (SIPR), and a lecturer in criminology in the Law School at the University of Edinburgh. This issue explores some themes relating to contemporary policing in Scotland both more deeply and broadly than recent pre-occupations headlining in public debate. Articles include Diarmid Harkin on the concept of police ‘reform’, Louise Jackson, Neil Davidson and David Smale on the history of police mergers in Scotland, Kath Murray also takes a long view on official attitudes to stop and search. Researchers Annette Robertson and Lesley McMillan, and Sarah MacQueen and Ben Bradford report on experiments to test ideas about procedural justice and policing. How licensing regulations may be used as a crime prevention tool is explored by Jim Royan and John Eck using a real murder as a case study. Andrew Wooff reports on his research into the policing of antisocial behaviour in rural Scotland. The interface between research knowledge and policing practice is explored by Liz Aston and Cynthia Lum, and Andrew Aitchison interviews Paddy Tompkins on his work on policing in Serbia. Finally the editors share some thoughts about police reform in Scotland, setting it in an international context of change and evolution. This is also illustrated in Jan Terpstra’s article on police reform in the Netherlands. In ‘Take 5’ politicians respond to the question: How can the tradition of localism in Scottish policing be enhanced within a national police force? Other articles feature an interview with Liz Dahl and Maura Daily of Circle Scotland; Maija Helminen on funding criminal justice TSOs in Scandinavia and Scotland, Stephanie Fohring on trauma and the criminal justice researcher. Anne Pinkman writes about the fallout of the HMP Inverclyde decision; Nancy Loucks uses stories about real people to underline the challenges facing the courts when sentencing women, especially those with children.